Emily Vazquez's bright, fashionable attire, friendly attitude and driven approach to her work make her an inspirational figure and an integral member of the Office of Admissions. 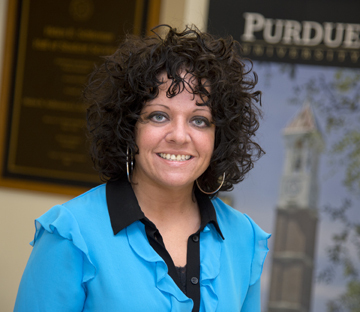 Vazquez started work at Purdue as a clerk and grew in her skills and education to develop her career. As an admissions operations assistant, Vazquez's duties include acting as the supervising analyst and lead operations trainer for the office, and providing support for senior associate director, Rebekkah Porter. How did you get involved with the Office of Admissions? I started as a student at Purdue right out of high school. At the time, I didn't take my education very seriously, and so I joined the workforce in 2001 as a young adult, starting as an entry-level clerk. I've worked my way up from the bottom to the leadership position where I am now. How have you expanded your experience over time? I realized that an education was the key to furthering my career. While still working full time, I completed a bachelor's degree in management from Indiana Wesleyan University. It was definitely a challenge to balance work, school and a family. However, as someone returning to education, I knew the value of a degree and what that meant for the future of my family; I think that's what kept me dedicated while trying to juggle everything. How does your previous experience in the office help you now? I think it is incredibly helpful that I've been in the same job positions as the people I am now supervising. I have a good feel for what they are asked to do every day, and I can step in and help with tasks as needed. I also recognize that there are always two sides to a story. In my capacity as a mediator I try to encourage open communication between two conflicting parties. By having been in the same shoes as the people I’m now managing, I can understand where many of the conflicts stem from, and I feel I am better equipped to mediate a disagreement. I truly enjoy learning new tasks and concepts, which has been a perk of my different positions. Learning new skills -- even something like using a new database program --always makes me feel energized and positive. I like to keep my mind feeling fresh, and understanding how to do something new always gives me a sense of accomplishment. I think that people can start to feel like they're in a rut if they stay at the same job for many years; working toward new goals by learning a new task helps to eliminate that feeling for me. What challenges do you face in the workplace? Because I have worked in the department at many levels, I’m now managing many of the friends I have made along the way. In my supervisory position I've had to draw the line between my professional and personal life, and make sure to keep work issues and conflicts confidential outside of the office. However, it is great to work with such good friends -- we can meet outside of the office and share in the experiences of the job and understand what the other is going through. I hope that, with more experience, I can grow in my abilities as a leader. I don't just want to be someone who can connect, communicate and manage others -- I want to be someone who can lead as a role model. I think that leading by example is one of the best ways to inspire others to act and change. I've also always been interested in fashion -- it's a passion I've had for as long as I can remember, and I know I'll continue loving it in the future. I hope that, in time, I can expand on this curiosity and perhaps pursue a career in the industry. I love music and I enjoy gardening.Working in my flower garden is my peaceful "me" time. I grew up helping my mother in the garden, and now I tend my own flowers. In the summertime, I feel like I could spend hours in the sun enjoying all of the colors and scents that flowers bring. I also love spending time with my family and young daughter, who is truly my motivation -- everything I do is to make a better life for her.